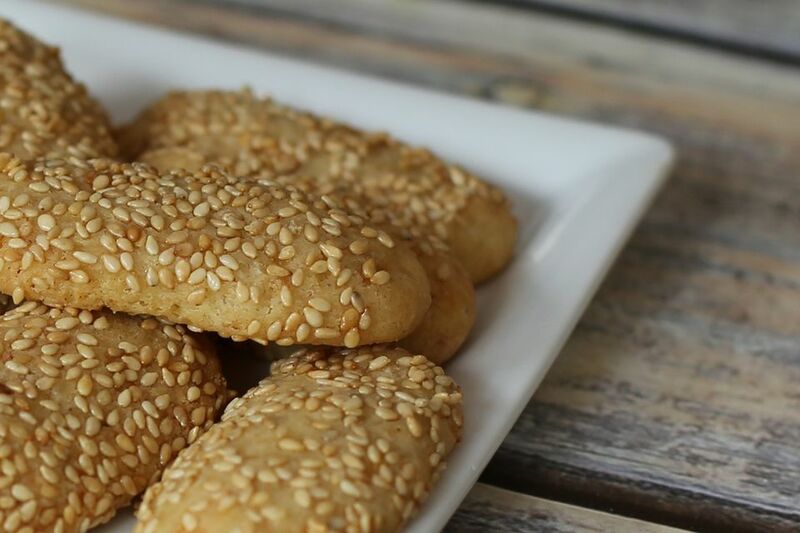 These delicious sesame seed cookies are coated with toasted sesame seeds. The recipe includes how to toast the sesame seeds. You might also find toasted sesame seeds in bulk. The cookies are easy to prepare and bake, and they make an excellent snack for any occasion. Line cookie sheets with parchment paper or leave them ungreased. In a large heavy skillet over medium heat, toast sesame seeds until golden brown, shaking skillet and stirring frequently to keep them moving. Remove from heat and set aside. Measure the flour, sugar, butter, water, baking powder, vanilla, salt, and egg into a large mixing bowl. With an electric mixer on low speed, beat until well blended, occasionally scraping bowl. With a spoon or spatula, fold in 1/2 cup of the sesame seeds. Using about 2 teaspoons of dough for each cookie, shape into ovals about 2 inches in length; roll in the remaining toasted sesame seeds. Place the ovals about 1 inch apart on the prepared baking sheets. Bake in the preheated oven for about 15 to 20 minutes, or until lightly browned. Remove the cookies to wire racks to cool. Store the cookies in a tightly covered container for up to 1 week.